Discussion in 'Gear Reviews and Comparisons' started by Philpug, Apr 14, 2019 at 10:34 AM. After spending a good amount of this season on Salomon's ripper S/Max Rush, I expected great things from the S/Force Bold; what I found out was not what I expected. The all-new S/Force Bold has the power of the S/Max, but what really surprised me was how easy it is to ski and how big of a sweet spot it has. You would think that a ski that has Salomon’s Edge Amplifier sidewall and a sidewall as thick as most 1980s race skis -- along with a binding that also comes from Salomon's (and Atomic's) race skis -- would require ton of input, but that is just not the case. The S/Force is as gentle as a tiger carrying her cub by the scruff of the neck, but make no mistake, that tiger can will show her claws when tested, and the S/Force has that strength when it pushed. Even though the S/Force shares much of its DNA with the narrower S/Max, Salomon made the S/Force much more compliant at its extremities. The S/Force does come easy into a turn and even with its flared square tail, it can easily be worked out of a carve without any resistance. Where there is a similarity to the S/Max is at speed; other than sacrificing a bit of edge-to-edge quickness, the S/Force is just as confidence-inspiring and stable at speed. Who is it for? The strong; even though the S/Force has a mild side, it is a burly ski and needs some mass to bend it. Who is not for? Weight weenies. The S/Force Bold is not a light ski. Insider tip: If you have a GripWalk boot, you need to bypass the X12 LT race-derived binding and go with the Z12 option. SpikeDog, Tom K., Mendieta and 1 other person like this. This has been in the queue for a bit and I finally got it posted but in that meantime I was able to get a few more days on this docile beast. Salomon was smart in not just making a wider version of the S/Max but to scale the flex to will what really sets the S/Force apart from it's narrower brother..this is truely a case where less (stiffness) is more. The inherent construction with the beefy Edge Amplifer design gives the S/Force the power you would expect but channeling the metal in the tip and softening the flex realy expanded the sweetspot in this all new ski. Mendieta, thebonafortuna and Scotty I. like this. That almost all black top sheet is freakin gorgeous. SpikeDog and Mendieta like this. It is really sharp looking, it is like a black camouflage. If truth be told..since they brought thte Force name back, I was kinda hoping for a throwbck to the old SuperForce 2S graphic, very well the best graphic that Salomon ever produced. 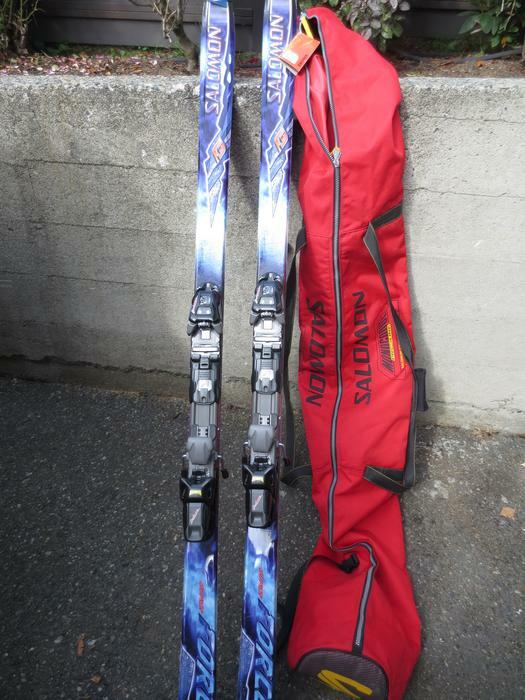 What vintage is this ski? I don't remember it, so I'm thinking it's probably early or mid-90's? Have you had a chance to ski it in beat up conditions? Crud, bumpy, lumpy etc..? I have. When we skied Northstar earlier this week it was 3" of heavy mank over firm conditions underneath and as the day went on and it warmed up with the sun coming out, it got heavier and heavier. Nothing seemed to phase the S/Force. I also did take it down some pretty big bumps, the square tail initially would get caught up a bit but it was just a matter of adjusting technique to allow the tail to follow through better. That you will have to wait for with some cage matches. 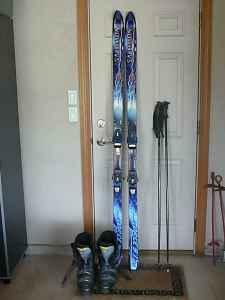 This is Mr. AmyPJs favorite ski from testing this year. Those who don't know, he's an L3 in his late 50s who still rips with the best of them. He LOVED these skis. I thought nothing would ever pry his E88s off his feet, but he has a pair of these lined up for the fall.